DMI Stochastic was authored by Barbara Star in the Stocks and Commodities Magazine, January 2013. The J. Welles Wilder Directional Movement Plus and Minus Indexes are combined to create an oscillator. These oscillator values are used as input to the familiar Stochastic Oscillator. A moving average of the price is also plotted. The DMI Stochastic combines J. Welles Wilder’s Directional Movement Plus (+DI) and Minus (-DI) Indexes to be able to identify high probability reversals as a prelude to a new trend. The DMI Stochastic subtracts the -DI from the +DI to create this oscillator which tracks trend strength and momentum, as most oscillators do. When the stochastic rises in value, price is also rising and when the stochastic falls in value, price is falling. The DMI Oscillator is used as an input to the DMI Stochastic (10, 3, 3). When the oscillator is negative, -DI is larger than +DI. It is important to gauge if the oscillator is increasing or decreasing, and not focus on the absolute value. (See weekly EUR/USD chart below). Let’s review stochastics. The stochastic oscillator is a momentum indicator introduced by George Lane in the 1950’s, which compares the closing price of an asset to its price range over a given time span. In general, stochastics can be used for trend confirmation, divergence, getting into the trend on pullbacks, and finding the end of the trend. In using the tool, we are going to discuss the strategy of getting into the trend on pullbacks. The first step is to determine what the trend is, up or down. The 50 Simple Moving Average (SMA) is used on the price chart to indicate whether the trend is bullish or bearish to take trades in the direction of the current trend. When price is above the SMA, longs are taken and when price is below the SMA, shorts are taken. This can be used as a filter to eliminate trades triggered by the DMI Stochastic that are not high probability. Please note that when price is sideways and trendless, the SMA will give false signals. Notice the downtrend in the EUR/USD on the left and the current uptrend on the right. For two years, the EUR/USD traded sideways around the 50SMA on the weekly chart. Let’s discuss trading signals on the Daily chart below by focusing on the right side of that weekly chart just discussed. When the DMI Oscillator is above the zero line, focus on long positions because it means that the price momentum is positive. Use the SMA as confirmation for the bullish trend. That is, only take long trades when price is above the SMA, and when the DMI Oscillator is above the zero line. That combination triggers the long position. Then, use the DMI Stochastic to buy on dips. In a bullish scenario, when the DMI Stochastic dips below the red line, and moves back above it, that completes the buy on dip strategy. 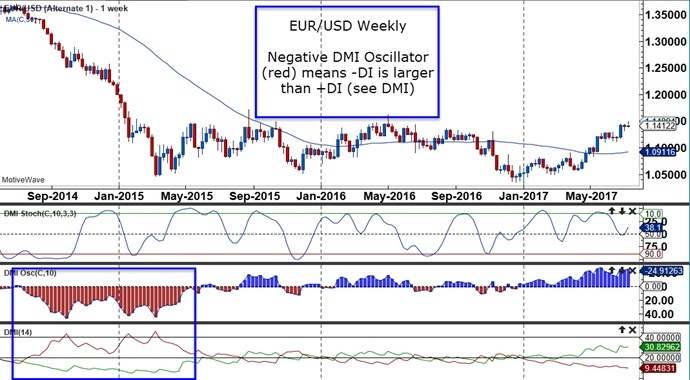 When the DMI Oscillator is below 0 and red, as on the left side of the Daily EUR/USD chart below, with price below the SMA, take short positions. Us the DMI Stochastic to sell the rally on a pullback, as in the case on the far left of the chart. This combination of SMA, DMI Stochastic and DMI Oscillator provides a clean strategy to enter a long or short position with a way to buy the dip or sell the rally. Learn how the DMI Stochastic helps keep traders in the trend longer, using a buy on pullback or sell on rally strategy. 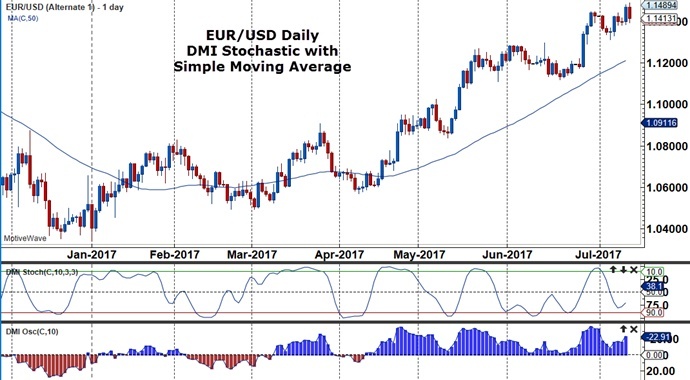 Start incorporating the DMI Stochastic into your chart set-up. Finally, use the DMI Stochastic in developing trading strategies. This entry was posted in Trading Tips and tagged day trading, DMI Stochastic, forex, forex trading, forex trading system, market analysis, swing trading, trading, trading plan, trading strategy, trading system.